Round 1: Weston Rutkowski is my pick. It’s not that I don’t think Beau Schueth can beat him, but Beau will have to beat him by 2 points just to overcome some of the World Champion bias that the judges have been showing Weston lately. Round 2: Goes to the Nebraska talent, Zach Call. Cody Greer has the backflip but Zach’s ground game is just way too tough to beat. Round 3: I’m gonna bet on Toby Inman once again. He didn’t quite have his legs under him in Ada, but I found out afterwards that he hit the gym a little too hard the day before. I’m sure he won’t make that same mistake twice. Round 4: Lance Brittan is going to take the win in this round. I personally thought he should have won his round last week but the judges saw it differently. Knowing what kind of competitor Lance is, I’m sure he will leave no doubt about who wins the round in Lewiston. Round 5: This is the easy pick of the night; the rookie Ely Sharkey did a heck of a job in Ada but Dusty Tuckness has way too much experience to be taken down. Championship Round: I’m going to pick Dusty Tuckness to win it all. He hasn’t had a lot of luck roll his way at the BFO events so far, but he has the mental toughness to overcome that. Besides that Ol’ Tuck just hates to lose. LEWISTON, Idaho – The action is intense and magnificent, but that’s exactly what the men expect when they decide to be part of Bullfighters Only. Fifteen men will stare danger in the eyes as part of the Bullfighters Only Lewiston Invitational, set for 7 p.m. Saturday at the Lewiston Roundup Arena. That’s what freestyle bullfighting is about, athletic men challenging their fears and testing their skills one-on-one with a Spanish fighting bull that is bred for this type of bout. Each fight is fast-paced and aggressive. The bullfighters use their natural instincts and tremendous athleticism to get as close as possible to the charging animals, their pointed horns and their pounding hooves. The BFO Lewiston Invitational will feature the world’s top 15 freestyle bullfighters battling for $25,000 in prize money. They will compete in five three-man brackets, with the five winners advancing to the championship round. The bullfighter that produces the highest-scoring bout in the final round will be crowned the BFO Lewiston champion. Bullfighters Only is a true man-vs.-beast spectacular. Spitfire will once again be part of the draw – one of many revered 12X & Costa Fighting Bulls that will be on hand in Lewiston. But they’ll be matched with some of the most outstanding bullfighters in the game, from young guns like Zach Call, Schell Apple, Beau Schueth and reigning world champion Weston Rutkowski to a bullfighting legend in Lance Brittan, the 1999 world champion. It’s a mixture of rising stars and proven talent, and it’s what makes the event such a spectacular showcase. “I’m excited about the talent that is coming up,” Brittan said. “I think the more I compete with them, the more refined their bullfighting will become. They’re fans of mine, and I’m fans of theirs. Some that watched me fight that night tried to do some of the same things I do in their bullfights. Tickets are just $15 and can be purchased at www.lewistonroundup.com/bfo-event. LEWISTON, Idaho – Because Bullfighters Only at the Lewiston Roundup was such a big hit last year, the rodeo’s organizers are taking it a step further in 2017. “There was an abundance of people who loved it and wanted more of it,” said Kirby Meshishnek, one of the directors of the Lewiston Roundup. Now they’re looking to Bullfighters Only help toward the bottom line while putting on a show that has had people talking for more than five months. The Lewiston Roundup Association donates thousands of dollars to charities in the quad cities region each year. They certainly did last year. On opening night, the 12X & Costa fighting bull called “Spitfire” beat up Ross Johnson during their fight, but that wasn’t the only time a bullfighter took a hit. It’s enough incentive for Roundup directors to reach out to the BFO again. The stand-alone event will feature the world’s top 15 freestyle bullfighters battling for $25,000 in prize money. They will compete five three-man brackets, with the five winners advancing to the championship round. 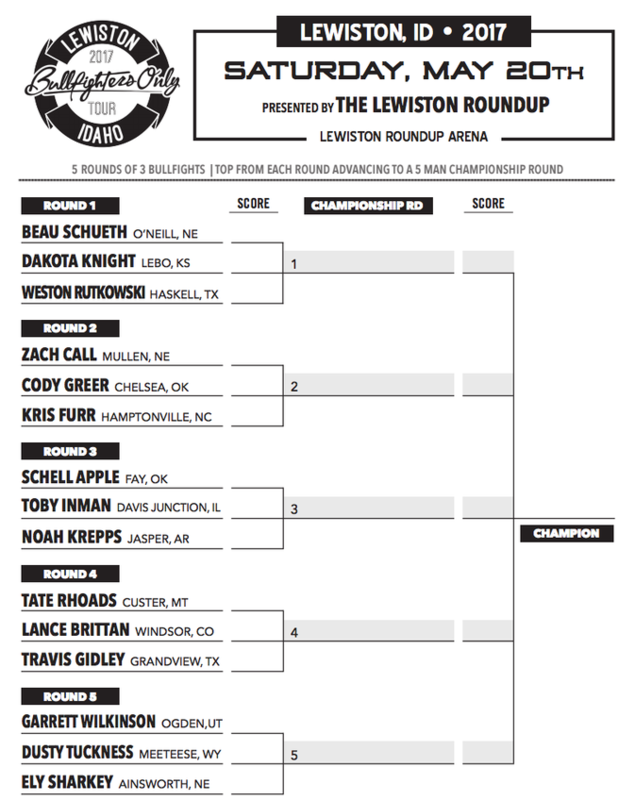 The bullfighter that produces the highest-scoring bout in the final round will be crowned the BFO Lewiston champion. Bullfighters Only is a true man-vs.-beast spectacular. “Spitfire” will once again be part of the draw - one of many revered 12X & Costa fighting bulls that will be on hand in Lewiston. Tickets are just $15 and they go on sale Feb. 27th at www.lewistonroundup.com/bfo-event.